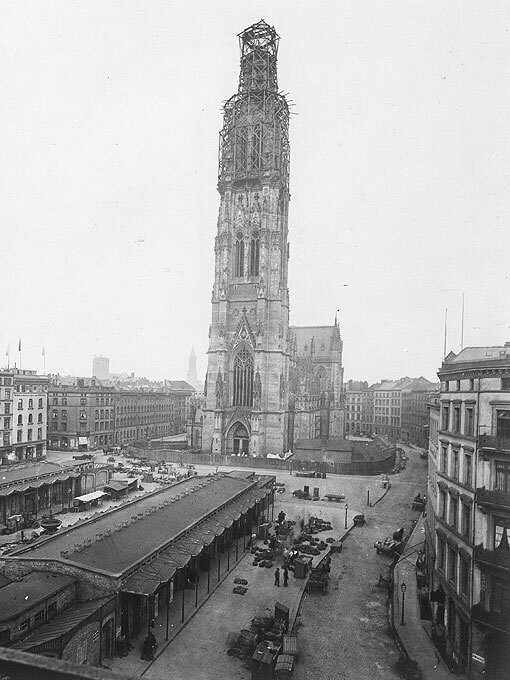 After the historical parish church of St. Nikolai had been destroyed in Hamburg’s Great Fire of 1842, the architect Gottfried Semper arrived from Dresden to help his home town. His ideas for reconstruction aimed at preserving the old town structure. The disaster, he felt, should not be taken advantage of to implement completely new urban development plans. The urban heritage should be preserved and only gently be modernised in order not to ‘replace the dignified character of ancient Hamburg with the inane modernity of newer cities’. In this spirit Semper advocated securing, preserving and taking into account the remains of St. Nikolai in the process of reconstruction. He was one of the first architects to see himself also as a curator of monuments. Semper, however, failed to gain acceptance. The public will to build a completely new church was all too powerful. A real citizens’ movement for St. Nikolai emerged. It organised an innovative and successful fundraising campaign. Every person in Hamburg was supposed to donate a shilling once a week, i.e. on Wednesday. Retailers acted as collectors. And indeed, two thirds of all households in Hamburg participated. The government promised to fill the remaining financial gap. So the ruin was demolished and cleared, and in 1844 tenders were invited for a new St. Nikolai church. 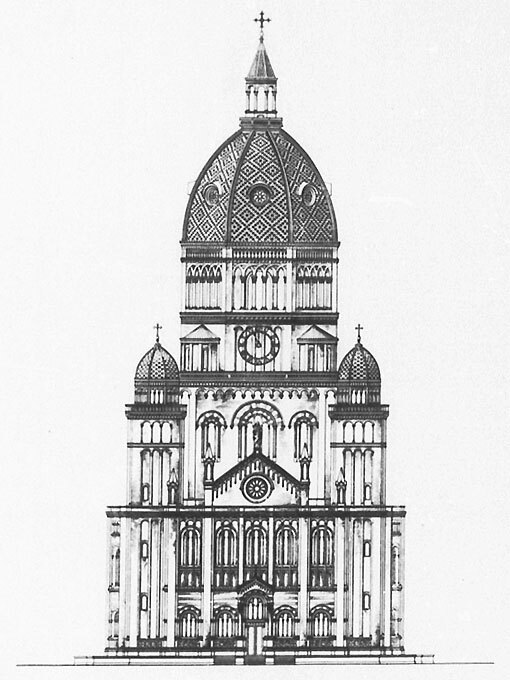 If Semper’s design had been implemented, Hamburg would have got a matching counterpart to Dresden’s Frauenkirche – an intelligently conceived, divinely beautiful church, modern, yet aware of tradition, large and slim, monumental, but not pretentious, coherent, yet not lacking in variety, part of the neighbourhood and at the same time a church for the entire city. Semper’s design stood out from 44 submissions. It was only logical for the jury to rank him first. In fact, construction work could have been started then. However, Semper and the jury had reckoned without the interested public and, above all, they had underestimated the effect of a certain building project in far-away Cologne. On 4 September 1842, when the last remains of the Great Fire in Hamburg were still smoking, the Archbishop and the Prussian king laid the cornerstone for the construction of the cathedral. An enthusiasm for the Middle Ages that had gripped the entire population finally breathed new life into the building site that had not been worked on for three hundred years. 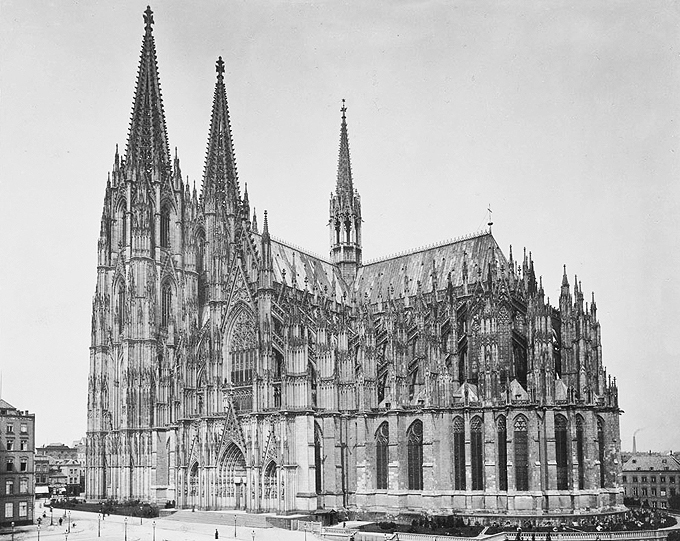 This passion for everything Gothic spread widely – even to Hamburg where people now also wanted a Gothic cathedral. When it became known that Semper’s not at all medieval design had won the competition, a public debate broke loose. In political terms, the predilection for the Gothic style reflected a young nationalism which propagated the conviction that the Gothic style was a genuine Germanic style and the pointed arch ‘more German’ than Semper’s round arch. This was also connected with a religious awakening movement which wanted to drive the spirit of the old renaissance out of the Protestant church. It was the parish of St. Nikolai, in particular, which supported the cause of an aggressive new Lutheranism. People were unable to appreciate Semper’s moderate, yet modern ideas. They wanted a medieval cathedral, a mighty fortress against all temptations of modernity. This is why preachers of the awakening movement and political nationalists fought for the consistently neo-Gothic design by a young unknown British architect, George Gilbert Scott, who in the competition had only made it to third place. 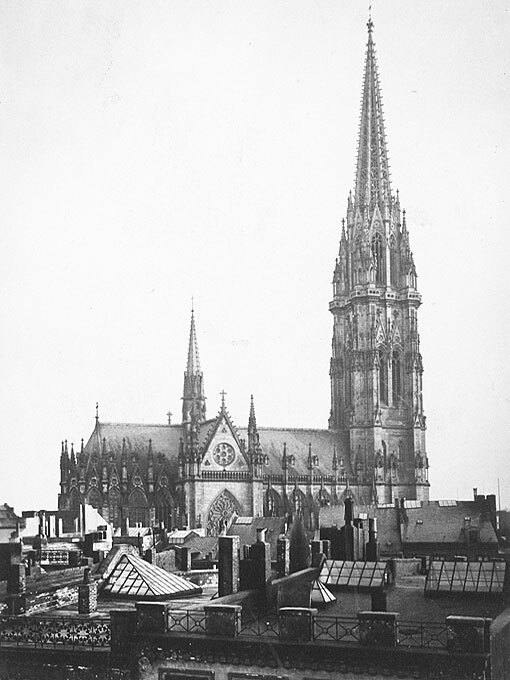 Even though his design did not meet essential requirements, it nevertheless fulfilled people’s longing for a Cologne Cathedral in Hamburg. The Church Building Committee could not withstand the public pressure and, consequently, did not support the jury’s decision. Instead, they asked an external expert consultant to submit his opinion. This was not exactly a Solomonic decision, as the expert consultant was known to be a decided advocate of the Gothic style. 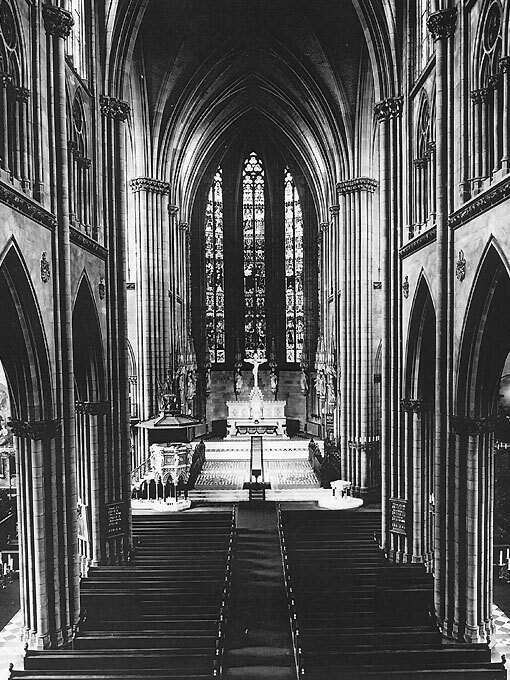 He was Ernst Zwirner, the architect of Cologne Cathedral. So it did not come as a surprise when he recommended that Scott should be awarded the contract. St. Nikolai took 36 years to be built. After Scott had been awarded the contract in 1844, the cornerstone could be laid two years later. 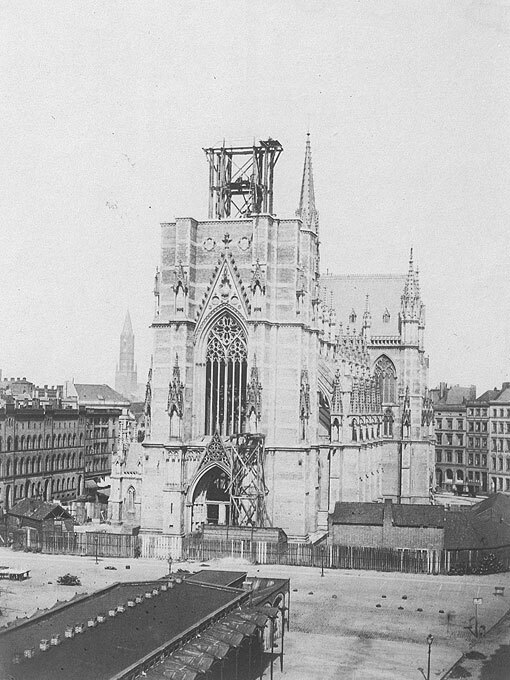 In 1859 the topping out ceremony took place, in 1863 the church was consecrated and in 1874 the spire. 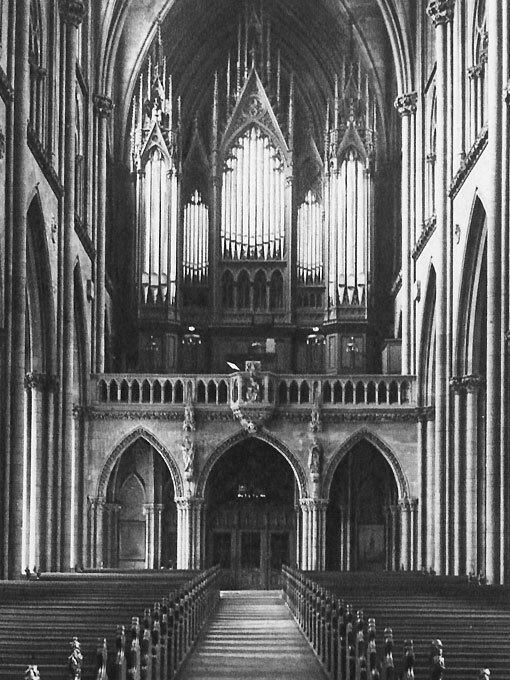 In 1882 building activities were finally completed – except for the great organ which was finished only in 1891. 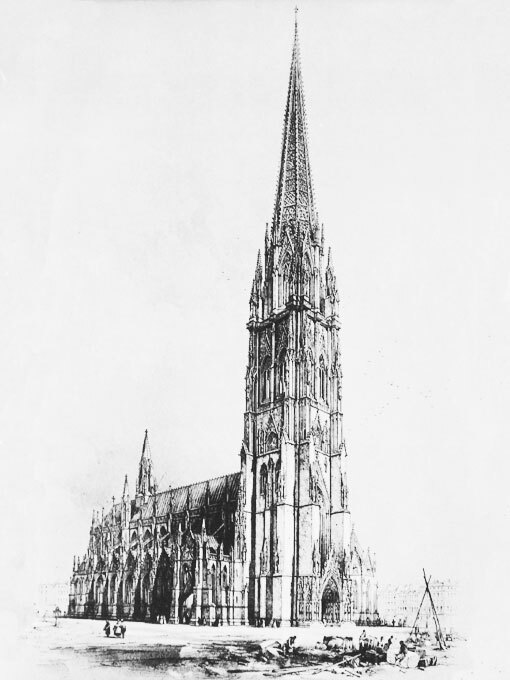 Scott’s church, the most important sacred building in the neo-Gothic style, was a three-nave basilica, 86 metres long, with a transept and three choir apses. It was dominated by a monumental, yet elegant spire, 147.30 metres high and even today the fifth highest spire worldwide. Next to it, almost hidden, a small baptistery had been added. 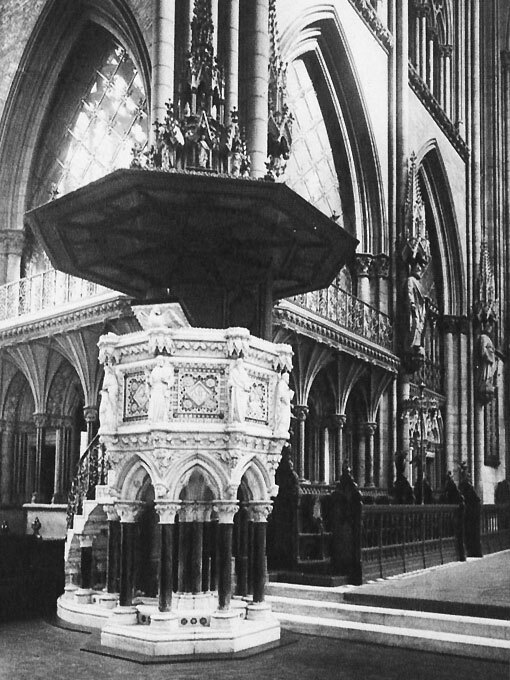 The interior was completely aligned to the altar – not the pulpit. The precious high altar was made of marble. It was surrounded by statues of Jesus Christ and the apostles which were attached to the chancel piers. The floor consisted of marble mosaics, covered with a ceremonial carpet made by ‘ladies from the parish’. From many seats it was difficult to see the pulpit on the north crossing pier. Nevertheless, it was elaborately made of white marble with coloured marble pillars. The church windows showed conventional pictures of the life of Jesus. An interesting feature, however, was a frieze of figures which was meant to run along the church walls on the outside, but was never completed. It was intended to present not only figures of the biblical history of salvation, but also persons from ecclesiastical and Christian cultural history. In this way, theologians, scientists, inventors and artists like Martin Luther, Johannes Calvin, Friedrich Schleiermacher, Johannes Kepler, Albrecht Dürer, Johann Sebastian Bach, Georg Friedrich Händel and Johannes Gutenberg were to be elevated to the rank of post-biblical apostles. The intention of the church was to offer the public a Protestant calendar of saints (unlike its Catholic model it did not comprise any women) which was to give an idea of how the history of salvation and the history of the world interpenetrated and the kingdom of God as annunciated by Jesus spread on earth. This picture programme was intended to make the church a place of commemoration for the entire city. In this way it came very close to museums and monuments, a phenomenon typical of the 19th century.